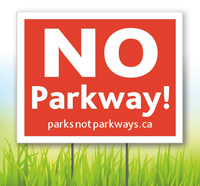 Parks not Parkways is a campaign by the Peterborough Greenspace Coalition to bring together voices opposed to the City’s Parkway Corridor development proposals: proposals that will pave over our priceless greenways, destroy our trails and build a bridge through Jackson Park. We feel there are better Smart Growth options for Peterborough. Here you will find maps, critiques of the evaluation process, alternate ideas and stories from individual people. We also include content from other websites that validate our arguments. The pages on the menus above outline our main positions. Each article outlines a single reason why we feel the Parkway proposals are wrong or describes a better alternative. Please, spend some time reading the different ideas and arguments in these articles. Think about the content and consider your position. If you agree with us, tell your friends and your City councillors. Above all, ACT NOW!